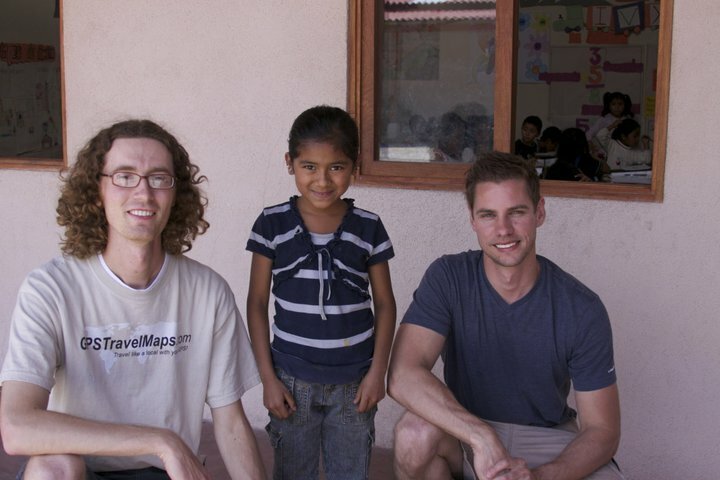 GPSTravelMaps.com owners -Aaron Young and Michael Burr with the child who's tuition is donated by GPSTravelMaps.com. Education for the Child is truly a worthwhile cause. GPSTravelMaps.com supports the tuition for a child in Guatemala through Education for the Children. Education for the Children exists to help some of the poorest children in Central America off the streets and into the classroom, providing a positive alternative to a life of begging. According to EDP trust web site, "in Guatemala, Central America, David McKee and his daughter Sophie McKee have worked incredibly hard to build up their amazing project which now provides education to 427 children. Education for the Children Foundation was formed in 2003 and initially provided support to 80 children in the poverty stricken area of Jocotenango. In just 6 years, the Foundation has grown to become a well respected provider of Primary, Secondary and Tertiary education in the region". Education for the Children, as stated on their web site, is a charity that "works towards helping the community break out of the poverty cycle through education and also provides social welfare to the children and families who are involved in the project. Nutritious food, healthcare, emergency shelter, clean drinking water and safe stoves have been life-changing initiatives in the community and help to increase the chances of a successful completion of education for the students". The owners of GPSTravelMaps.com, Aaron Young and Michael Burr, were fortunate to visit the school during one of their map data collection trips for their Guatemala GPS map. Aaron and Michael were able to see first hand how the tuition donation from GPSTravelMaps.com was being utilized. They were able to meet the child whose tuition was being sponsored (see images below). Amy Holly, of Education for the Children, gave Aaron and Michael a tour of the school. The school was filled with playful children in the courtyard. The classrooms surrounding the open sun filled courtyard were teeming with children learning all various subjects. The school was very well maintained. Aaron and Michael left the school feeling good that the tuition donation was being appropriated in the best means possible. If you would like to help Education for the Children in Guatemala then please contact Amy Holly of Education for the children at amy@eftc.org.uk or click on the image below to donate. These Guatemalan school children were very excited to have their photograph taken and to see their photos show up on the back of Michael's camera. These Guatemala school children were very excited to show their books off to Aaron and Michael. THe school will except spanish children books as a donation. Trust me when I say that this donation will be utilized! GPSTravelMaps.com and Kaart Data mapping Guatemala one town at a time!